I bought all of the stuff and was ready to make the traditional style of popper. You know the one, cheese in the middle and bacon wrapped around the outside, then grilled to perfection. All plans sometimes must be rethought and some take on a world of their own. 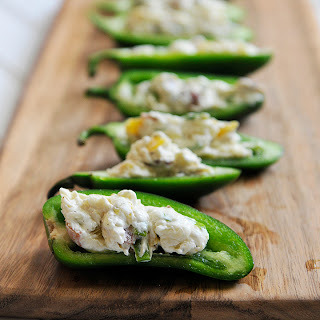 This is what happened with my popper recipe. When you can't do plan A you must switch to plan B. There was no way that these were not going to be in my tummy last night..NO WAY! How in the world was I going to achieve this perfect bacon experience in the oven? 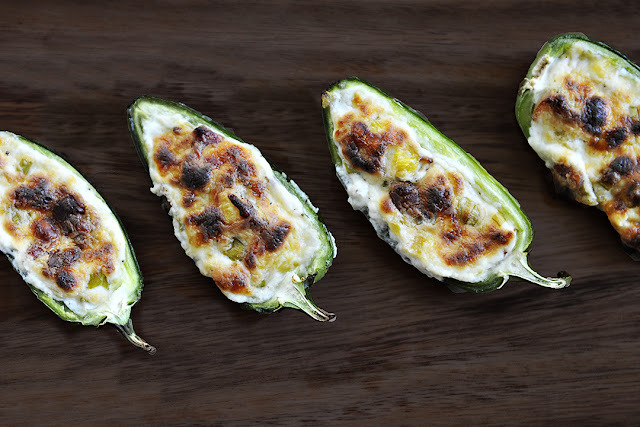 I decided to precook the bacon, cut the jalapeno's in half and embellish the cheese with MORE cheese variety...this was starting to shape up to be an amazing POPPER experience. FYI: I like my bacon medium crispy with the ends cooked slightly...the edges crispy and the middle soft. YES, it's true...I never eat bacon outside of my home! Picky, Picky, Picky! Preheat your baking stone and oven to 425 degrees. Cut your bacon into little pieces and cook. Grill your pineapple or saute it in a pan and mince. Grate your cheese (s) and prepare your jalapenos. 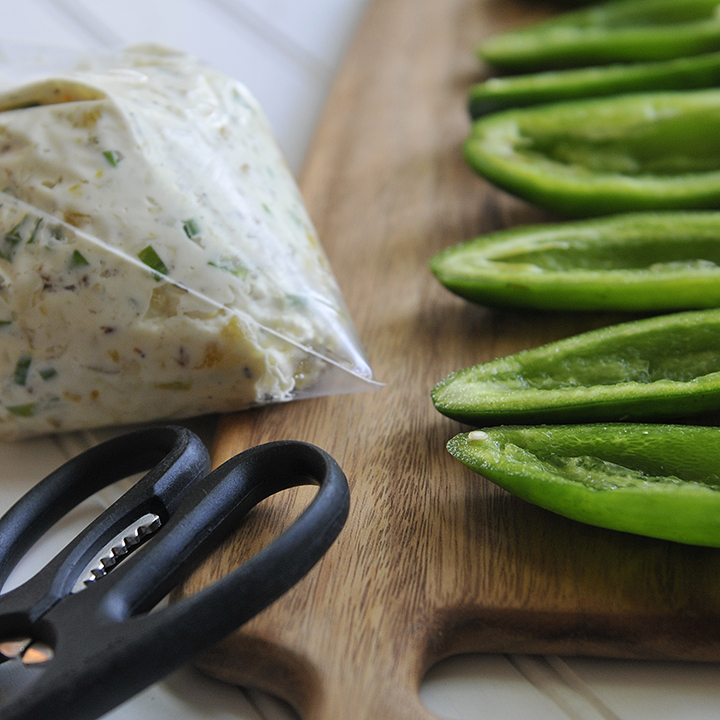 Cut the jalapenos in half and clean out the seeds. Wash and pat dry. Set aside. 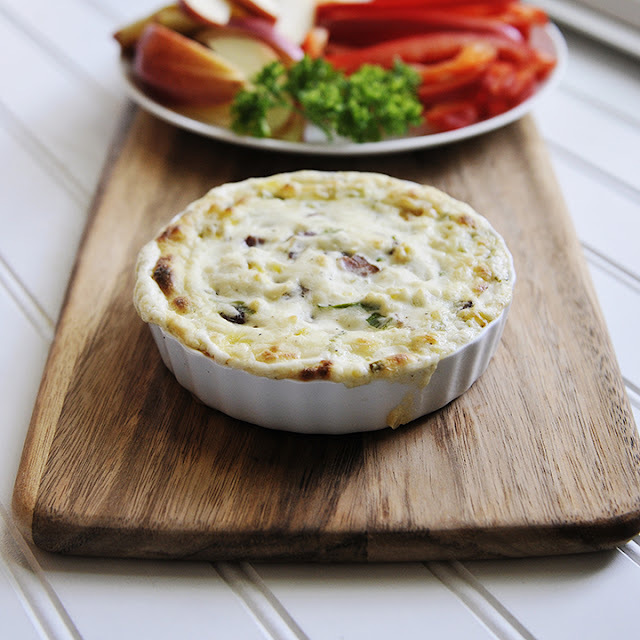 Prepare the filling by combining all of the ingredients and mix well. 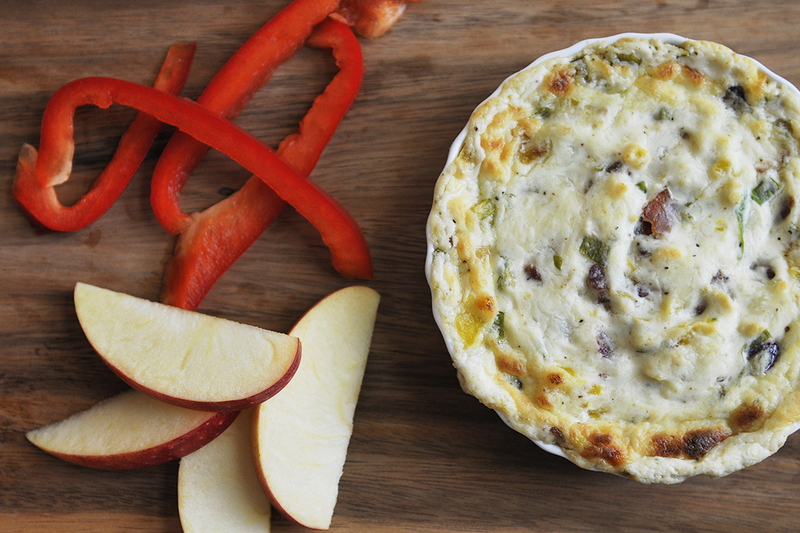 The great thing about this filling is that you can add anything you want to make it your own. Get crazy, live on the wild side. Because I did not have the grill to cook them on (this time) I used my baking stone. 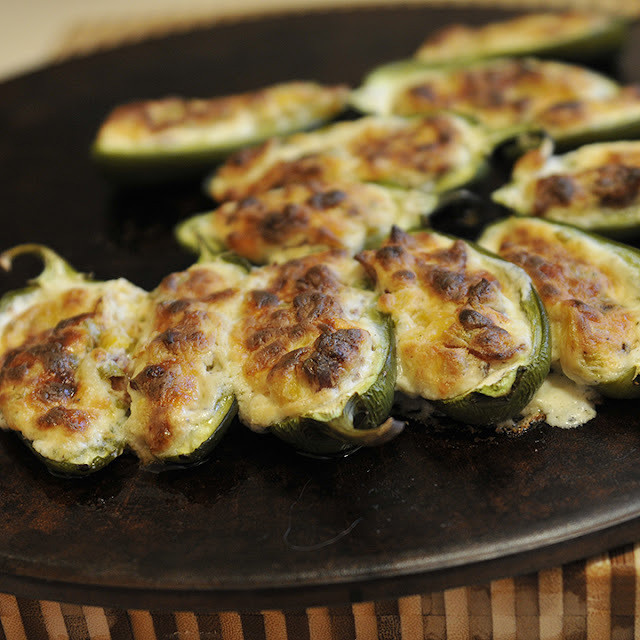 I preheated the stone so that it was piping hot and gently laid my poppers close to each other. I could hear the sizzle and smell their hotness immediately. OH SO GOOD! 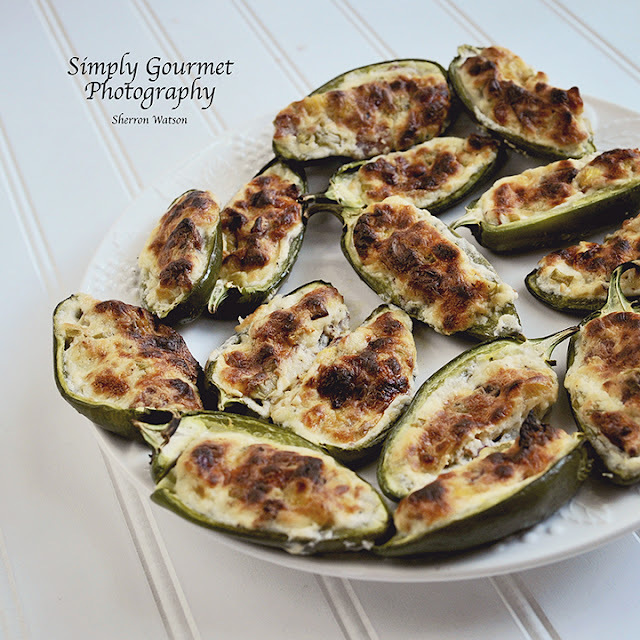 Bake the poppers for 15-20 minutes. 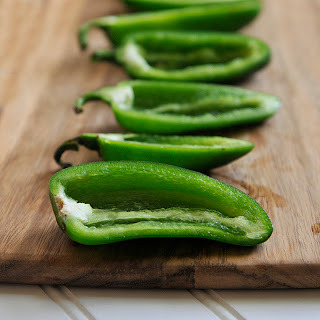 You want the jalapeno to be soft (not mushy) and the topping to be browned. We served ours with rice. It is a nice compliment to the jalapeno, especially if you get a really hot one! Thank you Ann and Cory! These will definitely be made again in our house hold! These look really tasty. I've bookmarked this recipe. Thanks! 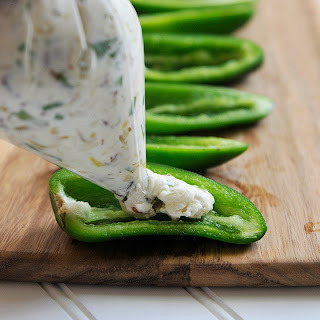 These jalapenos look amazing, Sherron! I love the vibrance of the dish and of course the way it's making me drool! :) Happy Holidays! I agree with you on the bacon! 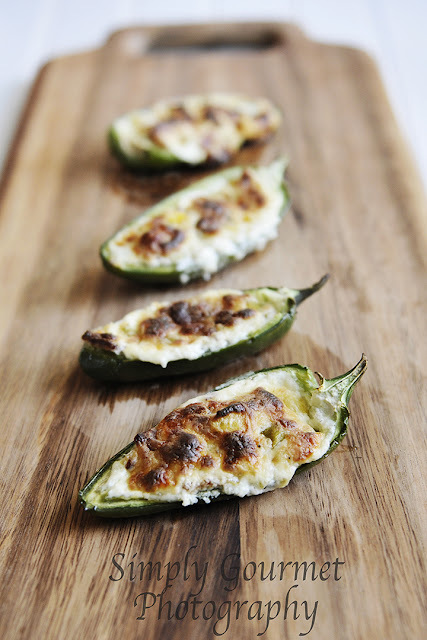 I will definitely making these yummy poppers soon! Thanks Monette and Ray….have a happy holiday too! I take a strip of bacon cut in have and then wrap around each popper top with cheese. Bake in oven at 450 for 20 minutes!